Andrea, a member of the Crossmen color guard, sent this picture. These are two pictures from a recent trip my friends and I took to New York City. 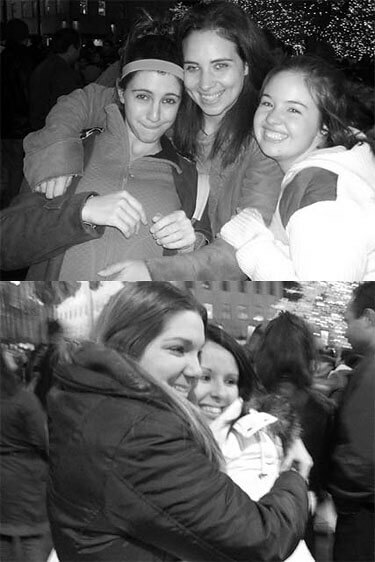 These pictures were taken in front of the Christmas tree at Rockefeller Center. Top picture left to right: Marielle, me, Annie, Melody and Rachael. Marielle and I march as members of the Crossmen, Annie marches with Boston Crusaders, Melody is undecided on where she is marching for the 2007 season and Rachael marches with the Santa Clara Vanguard. We all met when we marched together in the Jersey Surf back in 2003, and even though we have gone our separate ways in the past four years, we have all remained friends. We make it a tradition every year (along with some of our other close friends) to get together around the holidays.